My walk finished, I plop down in a chair at Talismã, my favorite kiosk. The waiter looks at me and raises an eyebrow in question. I nod and mouth, “Coco.”I hear him behind me, hacking the top off a chilled coconut with a machete, and in seconds it’s on the table before me. Slipping a straw in, I take my first sip and can’t help but let out an audible, “Aaaah.”I’m feeling good. I’ve just finished a 45-minute walk, and it’s only 7:30 a.m. But I’m not the only person out getting exercise this morning. There is a steady stream of walkers, joggers, and cyclists, with a few Rollerbladers thrown in for good measure. As I watch the procession, Speedo Man powerwalks past, wearing his trademark black Speedo, white tennies, and nothing else. I can’t help but smile. It’s good to be back in Vila Velha. This is, after all, where my love affair with Brazil began, way back in 1993. On that first trip, I fell in love with the friendly people and the incredible natural beauty. All these years later, after a new currency, a few new administrations, an economic boom and a subsequent bust, I see that Vila Velha hasn’t changed all that much. And that pleases me deeply. Now, it’s true that Vila Velha doesn’t offer everything that Rio does. Vila Velha is a beach town, pure and simple. It has some nice eateries, to be sure, but nothing like the chic (and overpriced) restaurants of Ipanema and Leblon. It has few nightclubs, and boasts no Museum of Tomorrow. Then again, Vila Velha, at a fraction the size of Rio, also has much less traffic, pollution, and crime. And it’s cheaper—way cheaper, especially its real estate. Vila Velha is perfect for me right now. I wanted a warm place to winter, and a place where I could get back in shape. 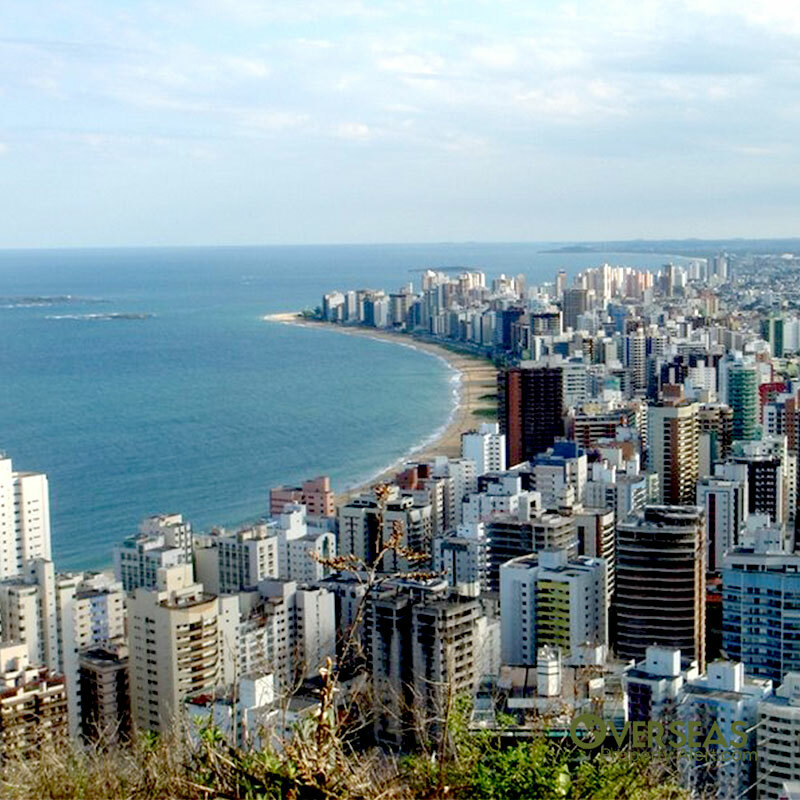 Vila Velha, with its warm climate and healthy lifestyle, fits the bill nicely. I doubt that any people in the world enjoy the beach more, or in as many ways, as do Brazilians. On the calçadão—the wide beach sidewalk—people walk and jog morning and evening, with skaters weaving among them. Cyclists zip past in the bike lanes. Down in the sand, there is always a game of soccer in progress. You’ll see volleyball, and also that most Brazilian of sports, futvolei, which is—if you can imagine it—beach volleyball played without hands or arms! Farther down toward the water, the serious joggers plod through the sand past the couples playing paddleball. Surfers hunt the next big wave, while farther out, kitesurfers skim the crests of the glorious South Atlantic. After working up an appetite exercising, there are plenty of places to satisfy your hunger. As you might imagine, seafood is on almost every menu, with fish, shrimp, crabs, and oysters all figuring prominently. The food is fresh, and portions generous. I suggest the moqueca, a thick and hearty seafood stew. Although varieties are found up and down Brazil’s lengthy coastline, many regard the moqueca capixaba as the absolute best. You can get a complete lunch for two at a beachside kiosk—fish, rice, and salad—for less than 50 reais (about US$15). After exercise and a filling lunch, you might be ready for a bit of relaxation. There are several kiosks along the strand where you can kick back and enjoy Brazil’s signature drink, the caipirinha, or an estupidamente gelada (stupidly cold) beer. A 600-ml bottle of beer (just about equal to two 12-ouncers back home) runs six or seven reais—about US$2. So smile and order another! Even the best of beaches can become a bit boring after a time. But there are also many interesting side trips from Vila Velha. Just over the bridge lies Vitória, her sister city and the state capital. 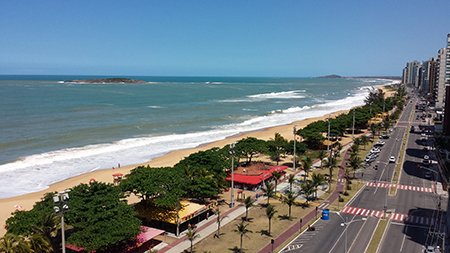 Vitória has her own beaches and more in the way of arts and performances. Its historic center, perched on a hilltop, has many well-preserved colonial buildings. Heading inland, within an hour you can find yourself in the serra, the highlands which lie parallel to much of Brazil’s southeastern coast. Here you’ll find the quaint little German town of Domingos Martins (see OPA, September 20, 2016), where Pomeranian is sometimes still heard on the street. A bit farther on lies the awe-inspiring Pedra Azul (Blue Rock), and swaths of the original Atlantic forest. Nearby is Santa Teresa, an Italian village which hosts an annual jazz festival and is home to a few wineries. You might expect all this to come with a hefty price tag, but Vila Velha is surprisingly affordable. I took a short-term lease on a one-bedroom, one-bath apartment right on the strand, fully furnished, all utilities included, for US$500 per month. And the last thing I hear at night, and the first thing I hear each morning, is the crashing of the waves. A two-bedroom, two-bath, 70-square-meter (753-square-foot) apartment with balcony is available in the Itapuã neighborhood, less than three blocks from the beach and centrally located. The building offers many amenities, including 24-hour security, barbecue area, pool, and more. BRL$210,000. is available only two blocks from the beach in Itaparica. One bathroom is en suite. The unit is air conditioned, and the building offers many amenities including 24-hour security, pool, barbecue area, party room, and gym. BRL$260,000. If you’d like something more spacious, a three-bedroom, two-bath apartment of 130 square meters (1399 square feet) is available in Itaparica just yards from the beach. The unit includes maid’s quarters and the building offers a barbecue area and pool. A one-bedroom, one-bath, completely furnished apartment of 40 square meters (431 square feet) is available in Itaparica. Well-located, just across from the beach and near the market, laundry, gym, and restaurants. Easy to move in and explore the area. BRL$1,640 per month including condo fee. A roomy two-bedroom, two-bath, 70-square-meter apartment (753-square-foot) is available in the desirable Praia da Costa neighborhood in the second block from the beach. The unit comes furnished. Near all amenities. BRL$1,550 per month, including condo fees. Vila Velha is easily reached. There are several flights daily from São Paulo and from Rio to Vitória’s Eurico de Aguiar Salles Airport (VIX). From the airport, take a cab across the Terceira Ponte (Third Bridge) to Vila Velha. If you’d like to learn more about Vila Velha, you can read the feature profile in January’s Overseas Living Letter. Good info on the Wine. I live in Salem, Oregon, and the wine industry here is taking off. The top-producing wine states are all on the Pacific Coast. California, Washington and Oregon, in that order. I own stock in the largest winery in Oregon – just south of Salem and might be a chance there to hook up and find more economical growing facilities and ground too. I read your info – and am also looking at moving to the warm climate – Central or South American countries. Keep up the good work. You mention a possible move to Latin America. As you no doubt know, there is a flourishing wine industry in Argentina and Chile. In Argentina, most wines are produced in the western valleys, from Mendoza stretching north through La Rioja and up to Tucumán. Argentina is best known for its reds. Chile, much of which has a Mediterranean climate, produces wines up and down its length, both reds and whites. Fewer people are aware of the growing viticulture in Brazil. It is centered principally in Brazil’s southernmost state of Rio Grande do Sul, in the upland areas. Being objective, the reds are merely OK. You might know the Marcus James brand, which is produced here. But the whites, especially the Spumante-style, are often quite good. This wine country is a very popular holiday destination for Brazilians. Admittedly it’s a bit far for most Americans to visit just to sample the wines. However, if you were perhaps thinking of opening a vineyard in South America, Rio Grande do Sul could be a place to look. It’s also a lovely area, sprinkled liberally with waterfalls and beautiful overlooks of lush valleys. Thank you for the clarity and crispness of your writing! I do have a question that I have not seen any references to, regarding apartments. I have fibromyalgia, and a concurrent sensitivity to noise. Most of the apartments I’ve seen described sound lovely, but make no mention of noise levels. Could you kindly comment on what can be expected? I fully realize that we will most likely require a single residence of some kind, but I don’t want to rule out apartments so early in my research. Although I don’t have fibromyalgia, I also have a heightened sensitivity to noise compared to most folks. Frankly, this can definitely create challenges when looking for a new residence. Other cultures can seem quite noisy compared to what we North Americans are used to. While I try to accept noise when out in public areas, I do desire quiet when I come home. Currently I live in Brazil. Here, as in much of Central and South America, buildings are generally built of concrete and brick, and this is almost universally the case for apartment buildings. While sturdy, these materials also conduct sound very well. And insulating layers, in external walls or those separating apartment units, are rare. Add to that the fact that Brazilians in general talk and laugh loudly—not passing judgement, just stating a fact—and you may have a recipe for frustration if you don’t have a fairly high tolerance level for noise. I think you’ll find these comments to hold true across much of Latin America, and no doubt some other countries as well. You are probably correct that a single-family residence is going to be a better choice for you. Try to buy on a decent-sized lot so there’s a bit of space between you and your neighbors. Also try to find out about nearby dogs, kids, etc., before making a final decision. Older neighbors will probably be quieter and more considerate than younger ones. Be aware that culturally it may be considered bad form to knock on a neighbor’s door to complain about noise, and may cause issues long-term. So be as selective as you can before finally buying a place—and you might still want to pick up a good pair of earplugs as well. Mine sit on the nightstand. Have a question? You can write to Lee (or John) here. Curitiba, Brazil: Low Cost, High-Quality Life In The "Other Brazil"